Prairie Gold Chorus is proud to have the following quartets associated with our chorus. We endorse all of them as excellent singers and entertainers, suitable for any occasion. 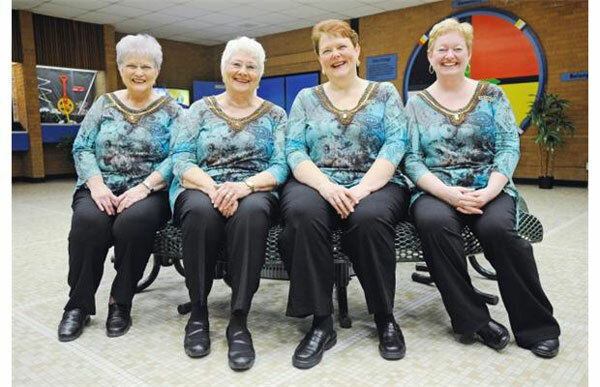 Prairie Gold Chorus is home to the well known quartet 'A Touch of Gold". 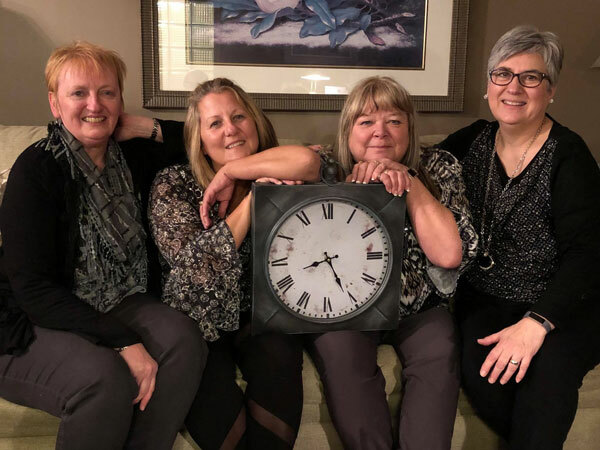 This talented foursome consists of chorus members (from left to right) baritone Helen Olinik, bass Pearl Hodges, lead Denise Lindenbach and tenor, Alison Tkach. "A Touch of Gold" entertains publicly and brings humour, fun and those beautiful barbershop chords to every performance. If you would like first rate entertainment for your function or party, please contact Denise Lindenbach at 306-789-2272. Val Neison (Tenor) - Val has been a Sweet Adeline for 30 years with musical education in piano- Grade 8 Conservatory and playing guitar. She has been singing since age 4, solo and in various groups and choirs. Val has been in a few quartets in prior years with “Blue Sage” and “Uptown” as well as a couple of unnamed ones. Barbershop really tweaked her interest & Sweet Adelines has given her many educational seminars and classes. Val has been able to pass on these learnings to others in her music leadership role to the choruses and quartets that she has been a part of. Marina Dovell (Lead) - Marina has nearly 30 years of Sweet Adeline experience. She comes from a family that always enjoyed music and Marina sang solo at an early age. She is a past member of 2 previous quartets, competing with “Gold Rush” and “Give It A Go”. Marina loves singing barbershop, and encourages everyone to always have a song in your heart as it is good for the soul. Susan Pander (Bass) - Susan has been a Sweet Adeline since 1991. She sang along with her parents on road trips as well as sing alongs at family gatherings and cottage campfires. Susan sang solo and duets at music competitions, church and school choirs…she was even on the infamous TV production “Profile” with a Fireside Ensemble in the 1970’s. Susan says that singing is a combination of music and language which has always been an enjoyment for her and thanks Sweet Adelines for all that she has learned. Marion Federko (Baritone) – Marion comes from a very musical family - in fact, her father still plays in a band at the age of 89! Her musical background includes high school glee club, church choirs and she was part of a quartet that sang at local parties and “soirees”. Marion has taken piano up to a Grade 9 level and has been a Sweet Adeline for more than 10 years.